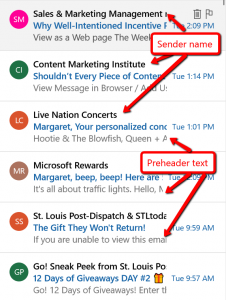 What do you put in the “Sender Name” field in your marketing emails? What you choose can make the difference between getting your email read and getting it passed over. Could you be shooting yourself in the proverbial foot without even realizing it? The sender name is what appears in the inbox of your email recipient. Look at the image to the right. The first line, in bold, is the sender name. There is one big thing to notice about the sender names you see in the image; they are all the names of the different organizations. There’s not one single personal email in the bunch. No person with whom the recipient might connect. No individual attention. Clearly, these are broadcast emails sent out to a subscriber base. The other thing, which you cannot see from this screenshot, is that all of these are in my “Other” folder in my email account, not in my primary inbox. If I find something that I would normally want to see in my primary inbox, I do have the option to mark it so future sends will go to my primary inbox. But… like most email recipients, I normally don’t do that. If it’s gift-giving season, I might go looking in my “Other” inbox for coupons or deals from various retailers who have me on their email list. Otherwise, those emails just languish in there, hoping that I will at some point look at them. Emails typically land in the “Other” folder or the “Promotions” folder because the email deliverer – primarily Google or Microsoft – has learned that the email recipient usually doesn’t open these emails. The level of engagement your emails typically cause is a huge piece of deciding whether your email is deserving of delivery to the primary inbox. Even a relatively new email sender can get trapped out of the primary inbox if the email is filled with links and images. Because, think about it, who sends emails filled with links and images? Yep, mostly organizations that are promoting something. What difference does the sender name make, really? What are you more likely to open: an email from an organization name, or an email from a person? In a study done by Marketing Sherpa a few years back, one organization realized a huge increase in open rates and clickthrough rates in their marketing emails – just by using a person’s name as the sender name. Compared to their standard promotional emails, the emails they send from a person (in this case, their sales manager), generated an improvement in their open rates of between 40% and 100%,and an increase in clickthrough rate of 10-20%. The organization profiled in this particular case study is a retail organization, selling products on line, so of course they’re sending promotional emails fairly regularly. They use the person-as-sender-name sparingly, and that tactic is working well for them. Normally, I would not cite a study from a few years ago in a blog post I’m writing today – except for this: we see the exact same thing happening right now. Emails from people get more clicks than emails from organizations. And, while an open rate is not to be celebrated, as we’ve said many times before, you’ve got to get your email OPENED and READ so that you can get the CLICK. And emails from people get READ more than emails from organizations. The CLICKS you then get are worthy of celebration. I know that many who read this post are still sending broadcast emails – big emails to the entire email list. It’s tempting to send them from your organization. Keep doing that if you want to (but you may want to test to see if you can improve your results by sending from a person even on those). As you may know, we strongly advocate that you use your broadcast emails to segment your list, then send more personal emails to your different segments – and then get even more targeted and personal at the third layer. For those targeted emails into your segments, and for those emails that are even more targeted and personal, start sending from a person. Oh – and that person needs to be real, and to have a real, monitored, inbox. Because, when you’re sending from a person, you’ll also get replies to those emails. Heck, you might even get a phone call asking for the person who sent the email. So make it a real person (and be sure they’re prepared for the replies, including out-of-office replies, they’ll receive). Do you remember the kid’s nursery rhyme, “This is the House That Jack Built“? It’s called a “cumulative tale” in that it builds on itself through each line. Everything in the tale is linked together. Whenever I think of email marketing and how one tiny thing can make a difference in EVERYTHING, I think of that rhyme. These are the sales that marketing built. To get the sale, you need the click. To get the click, you need the open. To get the open, you need to get to the inbox. To get to the inbox, you need emails that people open and click. “This is the maiden, all forlorn, that milked the cow with the crumpled horn that tossed the dog that worried the cat that killed the rat that ate the cheese that lay in the house that Jack built.” (And in my head, I always end that with a “buh buh buh buh BA-BA buh.” Don’t you? P.S. The featured image on this post is an image of a book you can actually buy on Amazon.